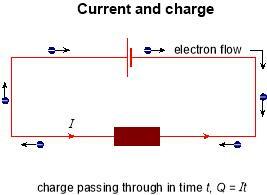 where I is current and Q is the charge flow in time t. The SI unit of electric current is the ampere (symbol A). The SI unit of charge is the coulomb (symbol C). One coulomb passes a point in a circuit each second when the current is one ampere. The direction of electric current is conventionally shown as from positive to negative, which is the direction in which positively charged particles would flow. Long after the convention was established, it was discovered that the carriers most often responsible for electric currents, electrons, are negatively charged. Electrons therefore flow in a circuit from negative to positive. An electric current is a flow of charge carriers. Thus a beam of electrons in an X-ray set carries a current, as does a beam of moving ions. Conduction in metals is due to the movement of conduction electrons. These are electrons that are free to move through the metal because they are not bound to any one ion in the metal. With no potential difference across the conductor, charge carriers move about at random. Under a potential difference, the charge carriers drift along the conductor. Electron beams are used in television and x-ray tubes, VDU tubes and oscilloscopes. An electron beam is usually produced in a vacuum tube by thermionic emission from a heated cathode. The electrons are accelerated from the cathode to an anode by a potential difference. The anode has a small hole in it which allows some electrons through. These electrons are then focused into a beam by further electrodes or coils. The electrons in the beam have a small range of speeds because they are emitted from the cathode with a range of energies. But to a good approximation, all the electrons in the same beam have the same kinetic energy and speed and are therefore equally deflected by electric and magnetic fields. This makes sharp focusing possible. In an oscilloscope tube, the beam is made to scan repeatedly along the same line, slowly in one direction then much more rapidly on return. A voltage waveform is displayed on the screen as a result of applying the voltage across a pair of parallel plates through which the beam passes. Magnetic deflecting coils are used to control the beam in a TV, x-ray or VDU tube. The current in the coil is varied to alter the magnetic field strength as desired and so drive the electron beam across the screen as required. Kinetic energy of electron (1/2) mv2 = eV, if its speed is much less than the speed of light. The potential drop across a component in an electrical circuit is like the pressure drop between the inlet and outlet of a radiator in a central heating system. The pressure difference drives water through the radiator. In the same way, a potential difference exists across the terminals of a component in an electric circuit, and drives a flow of charge through it. Potential difference is measured using a voltmeter. The potential difference between two points is the energy gained or lost per unit charge by a small positive charge when it moves from one point to the other. The abbreviation 'p.d.' may be used in place of 'potential difference'. In speech, the word 'voltage' is commonly used. The potential drop across a component is the energy delivered per unit charge when a small charge passes through the component. The SI unit of potential difference is the volt (V). 1 volt = 1 joule per coulomb. where E is the energy delivered and Q is the charge passed. Conductance is a measure of how well a component in a circuit conducts electricity. The symbol for conductance is G. The SI unit of conductance is the siemens (symbol S), equivalent to A V-1. One siemens is the conductance of a conductor through which the current is one ampere when the potential difference across it is one volt. The conductance of a sample of material depends on the number of charge carriers present and on how easily the carriers move through the material. 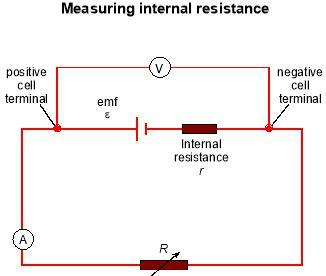 Resistanceis a measure of how badly a component in a circuit conducts electricity. The symbol for resistance is R. The SI unit of resistance is the ohm (symbol), equivalent to V A-1. Thus conductance and resistance are simply alternative ways of describing the same thing. Each is the reciprocal of the other. The choice of which to use is a matter of convenience. Perhaps conductance is rather more fundamental, expressing effect (current) per unit of cause (potential difference). The term resistance unfortunately suggests that a conductor 'fights' the flow of current, when in fact the flow is mainly determined simply by whether or not there are any mobile charge carriers. In a parallel circuit, charge flows from one point to another along alternative paths. The potential difference across components in parallel is the same for each component. The current through a parallel combination is equal to the sum of the currents through the individual components. Components in parallel can be switched on or off independently by a switch in series with each component. For example, appliances connected to a ring main circuit are in parallel with each other between the live and the neutral wires of the ring main. This is so they can be switched on or off without affecting each other. Light sockets connected to a lighting circuit are also connected in parallel with each other so they can be switched on or off independently. Where two or more components are in parallel with one another in a d.c. circuit, the current is greatest in the component with the highest conductance. The potential difference is the same across each component and the total current entering the combination is the sum of the individual currents. Since conductance is proportional to current, the total conductance of the combination is therefore the sum of the individual conductances for components in parallel. In a series circuit, charge flows along one path through every component in sequence. Thus the whole current passes through each component. The current through components in series is the same for each component. The potential difference across a series combination is equal to the sum of the potential differences across the individual components. The current passing through two or more components in series is the same because the electrons pass through each component in turn. Components in series are all switched on or off together by a single switch in series with the components. A fuse in a plug is always in the live wire in series with the appliance element or motor so that the appliance is disconnected from the live wire if the fuse blows. R = R1+ R2 + R3 . 1 / G = 1 / G1 + 1 / G2 + 1 / G3. Electromotive force (abbreviated to emf) is the energy a source can provide for every coulomb of charge flowing round a circuit. It is equal to the work done per unit charge, when a small positive charge goes round the whole circuit. The SI unit of emf is the volt (symbol V). A source with an emf of one volt provides one joule of energy for every coulomb of charge flowing round a circuit. 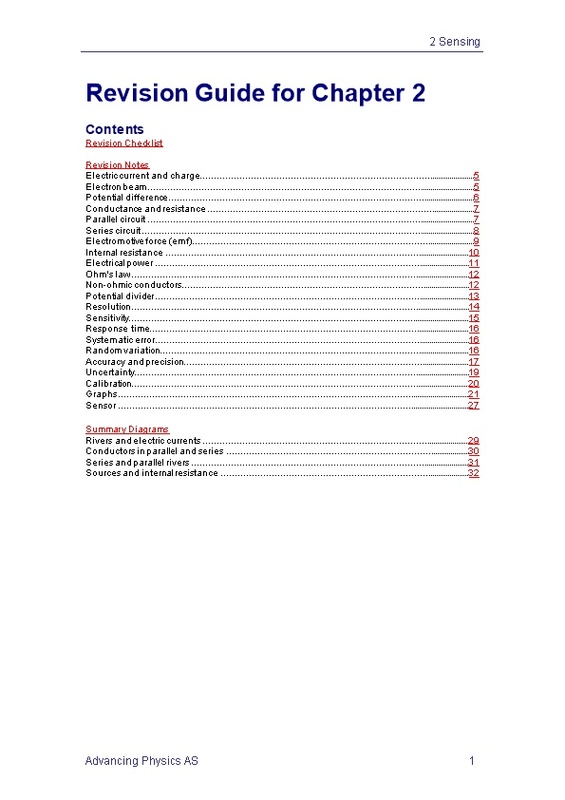 Electrical sources of energy include batteries, solar cells, thermocouples and dynamos. Electromotive force  = energy provided / charge delivering this amount of energy. Energy E provided by a source is given by E = Q where  is the source emf and Q is the charge delivered. Internal resistance is the resistance internal to a source of emf. The energy provided by a source is delivered to the components of the circuit by charge flowing round the circuit. Some of this energy is dissipated inside the source due to the source's internal resistance. This causes the potential difference across the terminals of the source to be less than the emf of the source. The lost p.d. in the source is the energy dissipated per unit charge inside the source due to its internal resistance. The lost p.d. depends on the current and on the internal resistance of the source. where IR is the potential difference across the load resistance and Ir is the lost p.d. The external p.d. V = I R = –Ir. The graph below shows how the external p.d. V varies with the current drawn. This graph has a gradient –r and a y-intercept equal to . Note that the p.d. V falls as the current increases. This is why the output potential difference of an electrical source of energy (including a power supply unit) falls if more current is drawn from the source. The headlights of a car often dim for a moment as you operate the starter motor. Electrical power is the rate at which energy is provided by an electrical supply or used by an electrical appliance. The SI unit of power is the watt (symbol W). One watt is a rate of transfer of energy of one joule per second. Mains electricity is priced in kilowatt hours (kW h) where 1 kW h is the energy delivered in 1hour at a rate of 1 kilowatt. Note that 1 kW h = 3.6 MJ. Current is charge per second flowing through the component or device. Potential difference is the energy delivered per unit charge to the component or device. Ohm's law states that the current through a conductor is proportional to the potential difference across it, provided that other physical conditions, notably temperature, are constant. Many conductors do not obey Ohm's law. Materials that do obey Ohm's law, including many metallic conductors, are called 'ohmic conductors'. A graph of potential difference against current for an ohmic conductor is shown below. The graph is linear and passes through the origin. That is, the current is directly proportional to the potential difference. The gradient of the straight line is equal to the resistance of the conductor. Thus the resistance of an ohmic conductor is independent of the current. The relationship R = V / Iis used to calculate the resistance at any current (or p.d. ), whether the conductor is ohmic or not. If the resistance R is constant, the graph is linear and passes through the origin, and the conductor is ohmic. Thus for an ohmic conductor, the resistance R is equal to the constant slope of the graph of V against I.
R = V / I whether the conductor is ohmic or not (R not necessarily constant). An ohmic conductor (e.g. a metal wire at constant temperature) is a conductor that obeys Ohm's law. The graph of potential difference (on the y-axis) against current for the resistor is linear and passes through the origin, so its resistance is constant. By contrast, a filament lamp's resistance increases as the current increases so the filament lamp is non-ohmic. The resistance increases because the filament gets hot. This is because as the temperature increases, the conduction electrons become less mobile, due to increased scattering from vibrations of the lattice of atoms.